An installation by Japanese artist Yayoi Kusama originally created for the 1966 Venice Biennale has been reconstructed near Philip Johnson‘s iconic Glass House in Connecticut. Titled Narcissus Garden, it is a landscape installation that will be on view throughout the 2016 tour season to celebrate the 110th anniversary of Philip Johnson’s birth and the 10th anniversary of the opening of the Glass House site to the public. The exhibition consists of 1,300 steel spheres that float on the surface of a pond, each with a diameter of approximately 30 centimetres. 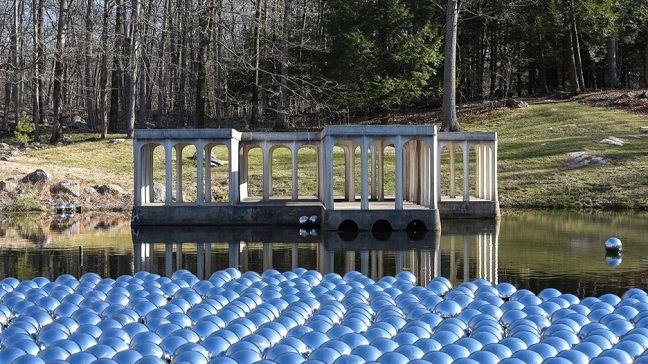 The balls have been placed in an area of Johnson’s Glass House estate in New Canaan called the Lower Meadow, in front of a pavilion designed by the architect close to the his famed 1949 glass-walled house. It is the latest art work to be exhibited at the estate, which encompasses 49 acres (20 hectares) and features 14 structures designed by Johnson and that will be on view until the end of November. “We are honoured to be working with Yayoi Kusama, an artist Philip Johnson both admired and collected,” said Irene Shum, curator and collections manager at The Glass House. 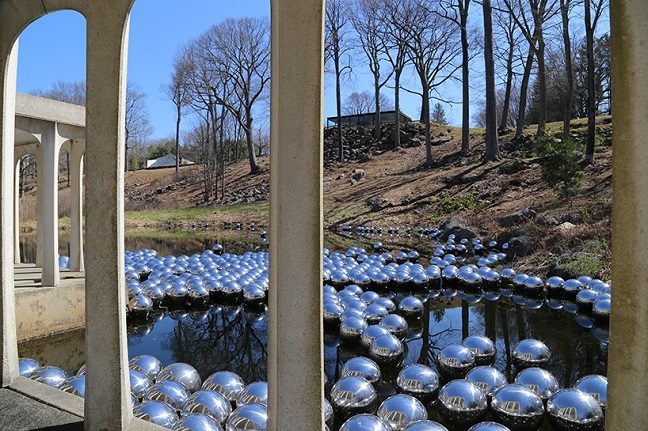 “Drifting in the newly restored pond, the spheres will move with the wind and follow the pond’s natural currents, forming a kinetic sculpture,” said the US National Trust for Historic Preservation, which owns the property. 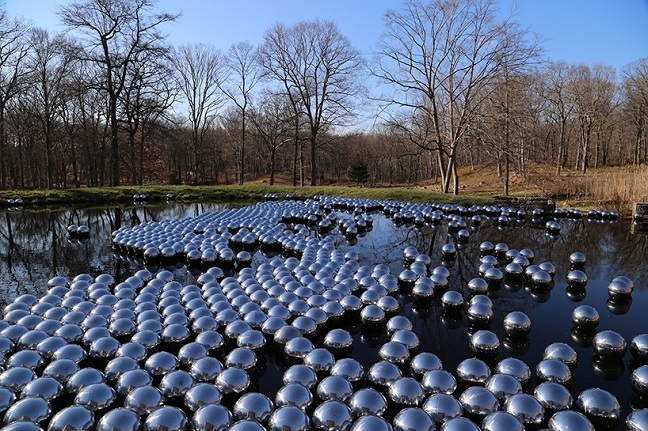 The mirrored surfaces of the balls reflect the sky and natural surroundings, as well as the Pond Pavilion, which Johnson built in 1962.